What is Knee Contusion (Bruised Knee)? A knee contusion or a bruised knee commonly occurs after an impact or extreme force on the knee. This can be a result of a direct fall onto the knee or something hitting the knee with force, such as a ball or stick. In medical terminology, bruise is termed as contusion. Cause of Knee Contusion (Bruised Knee)? A bruised kneecap occurs from a direct injury to your kneecap. This usually happens from falling onto your knee or by being hit by an object but it may also be a result of damage to the soft tissue, such as sprain of a knee ligament or strain to surrounding muscles (commonly hamstrings). Damage or injury to the smaller blood vessels (capillaries) within the injured tissue causes bruising. The blood escapes into the surrounding tissues, causing a black or blue appearance beneath the skin. Bruising usually appears within 24 hours of an injury and then slowly fades and becomes lighter in color, appearing yellow or green as the blood starts to disperse. Symptoms of a bruised knee include instant pain at the time of injury with bruising which may develop over the following day. The area will be tender to touch and there may be some swelling. Immediate pain is felt after the injury. Bruising occurs the next day. The color of the bruise changes and starts fading or shrinking after some days. Your provider will ask you about your symptoms and examine your knee. He or she may order an X-ray. A knee contusion that is considered mild or moderate should be rested. Do not continue to train or play if the knee is painful or bruised as this may increase internal bleeding and swelling. Apply the PRICE principles of rest, ice, compression and elevation. Ice can be applied for 10 to 15 minutes every hour initially reducing frequency as symptoms reduce. Monitor the bruising to ensure pain and the color of the bruising decreases over the following days. A severe knee contusion may require medical attention. A doctor will assess the injury and possibly diagnose and more serious damage to the tissues and structures in the knee such as ligament or cartilage. They may prescribeanti-inflammatory medications such as ibuprofen to reduce pain and swelling. Ice should of course be applied as soon as possible and continued for at least the first 24 to 48 hours. Generally, provided there are no other complications, a severe contusion is treated the same as a minor one, but the timescale for healing is much longer. Stretching and mobility exercises for the quads, hamstrings, groin and calf may be recommended if some movement is lost. Sports massage may be beneficial in the later stages, to prepare the muscles for sport and flush out any residual blood clots and other waste products. It is important following a bruise to any muscle part, that hot packs, hot baths and massage techniques are not used whilst there may still be new bleeding. This could lead to the development of Myositis Ossificans. 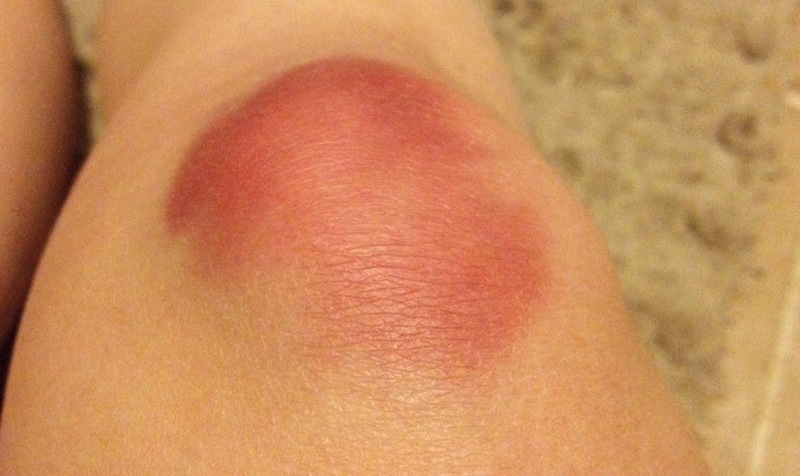 How can I help prevent a bruised kneecap? Most bruised kneecaps are caused by accidents that cannot be prevented. If you are in a sport that has knee protection, be sure that your equipment fits properly.